Welcome to Issue 4 of Catchment Connections. The desire of New Zealand land and water managers and researchers to work across the land-water-coastal divides and to learn from each other were no better demonstrated than at last month’s conference of the NZ Association of Resource Management. Partnered by the ICM research programme, the Nelson conference theme was ICM – are we wiser than we were? We could do no better than adopting the Maori view that people are part of nature. Both Ropata Taylor and Tina Porou noted that attempting to protect “the environment” simply perpetuates our separateness from it. Institutional and governance structures greatly affect our success in tackling impacts of land-use intensification and increasing water use. We heard from the Hon. Nick Smith of plans to streamline New Zealand’s Resource Management Act and for a new Environmental Protection Agency, and speculated how these moves might change our regional governance structures. Asserting that we aren’t much wiser than 30 years ago, Garth Eyles put out 5 challenges: focus research effort specifically into integrated land/water management; improve national coordination supporting regional land management; train groups of specialists to support regional land managers and landowners; support career development for land and water advisers, and articulate at national level the issues and solutions for integrating water and land use. Action on the ground for ICM requires leadership, and leaders need nurturing and resourcing. As dairy farmer Nicky Bavin noted during the Sherry River field trip, farmers shouldn’t worry about what their neighbours are or aren’t doing – just get on with your own sustainability initiatives and others will follow. Looking at leadership and ‘follower-ship’ we see that roles move around in a team and in communities, and that women can often be the ones to get change happening on the land. If we build trust among landowners then that will build community, and people learn best from others in their community. The power of modelling and of scenarios for the future allows us to see the big picture and how the system – whether a hydrological or socio-economic or combined one – responds when one element, such as land use, is changed. But we sometimes forget that useful models need to be grounded in good data and there are limits to modelling with old or incomplete datasets. Scale is an important organising issue for ICM, with Roger Young noting the value of ‘zooming in, zooming out’ to see what the actions at small catchment scale (e.g., Sherry sub-catchment) mean at larger catchment scale (e.g., Motueka catchment and Tasman Bay). Some inspiring examples of ICM action on the ground and in policy were described during the conference, and we all learnt from these success stories. We also heard of depressing trends in lowland water quality and ongoing soil erosion. ICM was cast not so much as delivering an outcome but rather as a process of deciding where that outcome should be and then getting on with it. This session was subtitled Wisdom for the Transition. Effective ICM is as much about behavioural change as it is about understanding catchment biophysical processes. As Chris Perley noted – paraphrasing Wendell Berry – we are in a crisis of culture in the way we treat the land, and we need to understand the rhythms of the land where we each live in order to develop the wisdom for sustainability. In our ICM research we have only scratched the surface of these challenges. In this fourth edition of Catchment Connections we review progress with Sherry River trials of farmer-friendly riparian restoration, look at how groundwater modelling can be linked with understanding freshwater ecology, and summarise work done with the Ecologic Foundation on improving water management under the RMA. Within the catchment modelling framework, IDEAS, we also explore how Maori cultural values might be represented, and how catchment land uses can impact on offshore marine productivity. Synthesizing catchment data to make them accessible and to understand the big picture is tackled in one way through the Toolbook CD-Rom. Finally, in ICM Out and About, we review a catchment nutrient management project with farmers in the Motupipi catchment, Golden Bay. A key measure of long-term ‘sustainability’ in any intensively farmed catchment is the extent and health of its riparian vegetation. This is well recognised in the Sherry River catchment. At present, the riparian strips alongside the river are dominated by introduced trees such as willows, and ‘weeds’ such as gorse, broom, blackberry, Old Man’s Beard (OMB) ,and rank grass. An important part of the ICM project has been to explore the most farmer-friendly means to restore this exotic cover to an indigenous one. By the look of the main trial alongside the river (see image) on the Bavin’s property, this has been achieved, with a thriving native shrub community now evident on a site where willows, blackberry and OMB once flourished. In addition, that process has only taken 3 years. However, the transformation has not been simple. As indicated above, the main challenge has been weed control. To this end, the site was initially cleared by bulldozer and digger, before a range of species were planted, and three weed control treatments applied. Two of these treatments involved ‘mulch’ covers of second-hand carpet and weed mat, the third used regular herbicide spraying. Alongside these were seedlings that received no weed control. Native seedling survival after 2 years with no weed control was 64%, and although this was significantly poorer than in the chemical control treatment (80%), it was not significantly different from survival in the weedmat (67%) and carpet (69%) treatments. Height growth and surface area covered by seedlings was best under the ‘mulch’ treatments of carpet and weedmat, especially the latter. The cheapest means of controlling weeds proved to be chemicals or herbicides (at $1.89/m2), but the difference was only 13 cents when compared with the cost of weedmat (6% more expensive at $2.02/m2) and carpet (7% more expensive at $2.04/m2). Other important issues were the need for regular applications by a skilled operator for chemical control, and the requirement of flat surfaces for carpet and weedmat. The species that grew tallest and covered the most surface area were cabbage tree, lowland ribbonwood, kohuhu, and karamu. New trials are underway to try to lower the weed threat further over early years. Before planting, rank grass growth is being encouraged to suppress woody weeds. This is then sprayed to create a thick, dead mulch, into which native seedlings are being planted with minimal soil disturbance. It is hoped the mulch can keep new weed growth in check for long enough to allow the native plants to get well established. 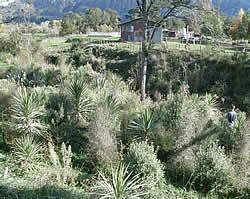 In summary, the trials show there is no simple solution for successfully establishing native species in weedy environments, such as exist alongside the Sherry River. Although the use of fast-growing species planted as quality seedlings, accompanied by good weed control, will help early survival and growth rates over the first 2 years, some on-going weed control is still likely to be required before adequate and long-term native species dominance of the site is achieved. Groundwater allocation has often been conducted without a thorough understanding of the connections between groundwater and surface water systems, and in many cases the effects of groundwater abstraction on associated surface waters are not considered. However, as more information has become available, the strong connections between groundwater and surface water systems have become apparent. Some surface water systems are closely linked with associated groundwater and any groundwater abstraction will have an immediate effect on river flow, whereas other groundwater systems are more separate, with lags between surface water flow variation and groundwater level. Some river sections ‘lose’ water to aquifers, other reaches ‘gain’ water from upwelling groundwater. The ecology of surface waters is expected to be profoundly influenced by whether water is being ‘lost’ or ‘gained’ from the aquifer. In particular, upwelling of cool groundwater potentially provides an important refuge for temperature sensitive species during the summer, such as the brown trout that support a nationally important fishery in the Motueka River. Our research on groundwater-surface water connections has focused on a 15-km section of the Upper Motueka River that has recently experienced a substantial increase in demand for water for dairying and horticultural development. The Tasman District Council has assumed that groundwater and surface water systems are closely connected and therefore treated applications for groundwater abstraction using the same rules as for surface water abstraction. However, this approach may be overly conservative. A groundwater-surface water model was developed to describe the patterns of upwelling and downwelling along the Motueka Valley and to determine the likely influence of groundwater abstraction (Figure 1). Temperature loggers were deployed over 18 months in three gaining reaches and three losing reaches of the Motueka mainstem and also in a spring-fed tributary and a groundwater well. Smaller scale thermal heterogeneity was also assessed manually during several intensive river surveys. Water temperatures in our study reach ranged from 4°C to 23.7°C. Maximum daily temperatures regularly exceeded the upper limit for feeding by brown trout (19°C) during summer and autumn. 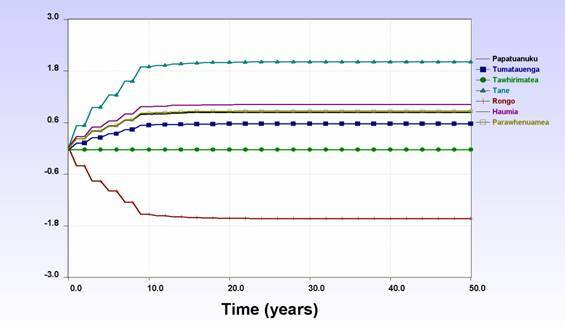 Our results suggest gaining reaches often had lower daily maximum temperatures during periods of low flow when groundwater represented a greater proportion of the total surface flow (Fig. 2). However, models of fish growth potential comparing gaining and losing reaches indicated that the differences in temperature that were observed were unlikely to result in appreciable differences in trout growth. We did identify several small-scale coldwater patches that were up to 3.5°C cooler than the mainstem, but these were generally shallow and unlikely to provide refuge for adult trout (Fig. 3). The exception was the springfed tributary, with a mean water temperature of close to 16°C during summer, which is very close to the thermal optimum for brown trout growth when feeding on an invertebrate diet (14°C). Trout were observed within the cold-water plume at the mouth of this tributary, which would allow them to thermoregulate when mainstem temperatures were unfavourable while still being able to capitalise on food resources available in the mainstem. This project has been a good example of integrated research with positive outcomes for the ecologists, groundwater modellers, resource managers, and wider community. The ecologists used the groundwater model to generate hypotheses about the location of upwelling and downwelling reaches that potentially represented refugia for trout during low flows. The groundwater modellers benefited by using the temperature data to independently predict the contribution of groundwater to surface flow, which they have been able to compare with their modelled predictions. The resource managers have benefited from an increased understanding of the resource and the likely magnitude of impacts associated with various abstraction scenarios. Finally, the local community has benefited from a more secure supply of water for irrigation and with the knowledge that permitted takes are indeed sustainable. Fig. 1 Part of the groundwater surface water model showing key river gauging sites and groundwater monitoring sites. Fig. 2 An example of the annual temperature record showing the difference in water temperatures between a gaining and losing section of the Motueka River, and the temperature regime of an adjacent springfed stream. Fig. 3 A springfed backwater of the Motueka River where water temperatures were up to 3.5°C cooler than the mainstem of the river. Improvements to New Zealand’s water management framework are needed, and this is recognised by the government’s Sustainable Water Programme of Action and most regional councils. Water allocation and water quality are under scrutiny nationally and internationally as competition for water increases and land uses intensify. Landcare Research, in conjunction with the Ecologic Foundation, researched new policy approaches that could improve outcomes from water allocation, in discussions with water users and stakeholders in the Motueka catchment. While we see benefits of greater use of market-based instruments in water allocation, effective water management requires a basket of complementary policy approaches, including underpinning regulatory rules, enforceability and mechanisms for protecting instream values of our water resources. We convened a workshop to respond to our discussion paper Enhancing Water Use Flexibility and Security using the Motueka Catchment as a Case Study (available at http://icm.landcareresearch.co.nz). Participants first identified trends and issues arising for water management over the next 20–50 years, then discussed improved methods for water allocation. Twenty-four representatives of the following sectors contributed: irrigators, instream and environmental interests, central and regional government, iwi, and community development. Stakeholder Water Management Committees (WMCs) – the workshop supported this ‘collaborative governance’ approach, with WMCs rostering water usage during shortages and possibly having responsibility for local catchment plans and meeting-agreed water quality targets. WMCs would need technical and administrative support from the regional council. 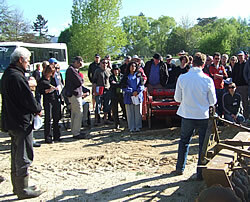 While instream, iwi and government interests supported an extended role for WMCs, in the post-workshop survey, irrigation and community development representatives had concerns about WMCs being responsible for catchment plans because of the time and cost, and perceptions of members being seen as ‘water police’. Further design is needed on the role and legal mandate for WMCs. Making Water Permits more Transferable – the workshop supported this market-based instrument for facilitating re-allocation of water, although there were some reservations about permanent transfers and the need to clarify property rights issues. Irrigation and community development interests were more supportive, while the other participants emphasised that the conditions of local use and environmental limits first need to be carefully specified. Security of Supply – Users would benefit from a clear indication on their water permit of their Security of Supply, with associated low flow restrictions. There was strong support for this proposition. Security of Supply also needs to be defined so that everyone is talking about the same thing. Water Metering for Water Permit Holders – Metering allows better management of water resources by both users and council. Workshop participants went further than the discussion paper and said that metering should be mandatory for all water users. ‘User pays’ for water planning and management – This received more support from instream interests and iwi. On balance, the workshop favoured a 50/50 split between abstractive users and general ratepayers as a pragmatic cost-sharing formula because the community receives benefits from water use, as do individual users. There was no discussion of resource rentals. Alternatives to the current ‘first-in, first-served’ allocation method – Although this did not receive much discussion, irrigators tended to agree that an alternative was needed where water demand is approaching allocation limits; other interests were generally neutral. However, none of the options we suggested received much support (balloting, Council decision based on criteria in plans, sale or tender by council). 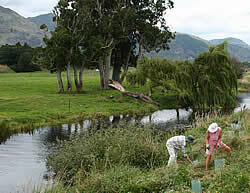 A summary of this research is contained in the report A Case Study of Water management in the Motueka Catchment – Responses to Water Allocation Reform Proposals available at http://icm.landcareresearch.co.nz/knowledgebase/publications/. Current land uses in the Motueka Catchment used to create scenarios of land use change in ENVISION. Among the developing integrative tools for ICM is scenario modelling, which incorporates visualisation methods and offers a powerful way to explore and ‘see’ future landscapes and catchments based on various forms of decision-making and desired input. Two hui were carried out at Whakatu marae, Nelson, with Tiakina Te Taiao Ltd, a pan-iwi resource management organisation representing Te Tau Ihu iwi (tribes of the northern South Island), on 2 April 2008 and again on 13 May 2008. Tiakina, made up of four main iwi – Ngāti Rarua, Te Atiawa, Ngāti Tama, and Ngāti Koata, was formally established in 2007 and is presently based at Whakatu marae, Nelson. The hui were to ascertain how cultural values could be recorded, expressed, understood, and incorporated into spatial futures or scenario modelling and whether iwi thought this was relevant and had application to their own research, planning and policy. The hui were used both to gain feedback on this research, and its approach and relevance, and to seek design input and other comment. Tiakina Te Taiao Ltd researchers have been developing frameworks and indicators for their natural environments and successfully used them in a number of iwi projects and cultural impact assessments, and for the development and monitoring of cultural indicators. The frameworks are used to collect information and knowledge (e.g., indicators) as well as report and visualise that knowledge and information (e.g., GIS). At the two hui, Oscar Montes de Oca Munguía and Garth Harmsworth presented the concept of IDEAS and introduced ENVISION, a tool that can produce future scenarios that reflect values and has the potential to include and evaluate cultural views in research, planning, and policy. The tool can weight the values being introduced and generate separate future scenarios accordingly, i.e. economic, social, environmental, and cultural. 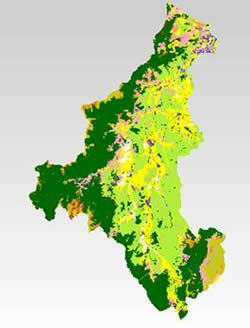 atua domains for a land-use change scenario over 50 years using the software ENVISION. During both hui there was general discussion about how tools such as ENVISION could incorporate cultural values and be used to communicate and visualise future scenarios and tradeoffs between cultural, social, economic, and environmental scenarios and also how the ICM team could include appropriate cultural indicators into the IDEAS framework. ENVISION could potentially be used by iwi to weight their preferred goals, priorities, and standards using cultural values that influence each of the social, economic, and environmental criteria, and then to generate and visualise various future landscape scenarios and consequences. This tool could be useful in articulating cultural values and aspirations during discussion and negotiation with groups such as central government, local government, industry, research agencies, and community groups. Further collaborative research work with iwi researchers will be required in order to make ENVISION work for Tiakina Te Taiao Ltd. It was agreed the best approach would be work with iwi researchers and to generate iwi-relevant examples that demonstrate how cultural values can be incorporated into future scenario modelling. Practical iwi examples could then be used to alter and explain tradeoffs between cultural, social, economic, and environmental goals. This work is therefore ongoing. As land use and climate changes occur in a catchment, nutrient flows to rivers and eventually the coastal environment also changes. Landcare Research’s SWAT catchment model (part of the IDEAS catchment modelling framework) predicts that human land use in the Motueka catchment has increased sediment and nutrient flows to our coast and further intensification or climate change have the potential to amplify these. Our study has utilised these data, along with satellite and numerical modelling analyses, to assess the impact of these changes on phytoplankton biomass in the river plume. Why study phytoplankton biomass? First, it is an important component of the primary production in the river plume, which provides the energy that supports the size and structure of the ecosystem. Second, artificial enhancement of phytoplankton biomass has been shown to have negative impacts in some environments and may result in increased occurrence of harmful algal blooms and anoxic conditions in extreme cases. Optimal phytoplankton growth occurs when the water column provides the necessary components (sunlight and nutrients) in the correct ratios. To assess if nutrient sensitivity occurs in the Motueka plume, we compared remotely sensed chlorophyll a (chla) concentrations, which are a proxy for biomass (Fig. 1), and estimated monthly nitrogen loads (a common limiting factor in marine phytoplankton). 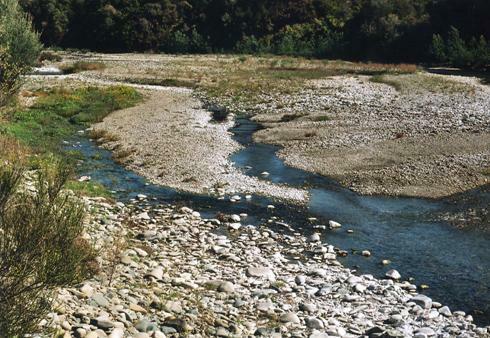 The results showed that higher monthly average chlorophyll concentrations around the Motueka River were associated with higher estimated nitrogen loads from the river. To test this relationship beyond the current range of observed loads, a depth-resolved numerical model (adapted from Sharples 1999. Progress in Oceanography, pp. 3–38) was applied to predict phytoplankton biomass changes that could be expected under different land use scenarios. The results of the model show a relationship exists between average riverine nitrogen loads and annual average chla concentrations from pre-human land use (with loads of ~300 tons/year) to the most intensive land use scenarios predicted by the catchment model (with loads of ~3000 tons/year). Assuming constant chla to biomass ratios, this translates to artificially increased average annual phytoplankton biomass of approximately 5% from current human land use and has the potential to further increase a further 30% with intensified land use (Fig. 2). To put this in perspective though, some areas of NZ are estimated to receive loads in excess of 10 000 tons of nitrogen per year from rivers (http://wrenz.niwa.co.nz). So what does this mean for the coastal environment of Tasman Bay? Recent reports have already highlighted the potential impacts on the commercially and culturally important scallop fishery in the region, with losses noted by commercial fishermen near the Motueka plume (The Nelson Mail, 13 August 2008). Although, this study shows that from a nutrient impact standpoint, the Motueka is not highly impacted at present, the implication that coastal species may be affected by what happens within the catchment necessitates a deeper understanding of all aspects of the system. An upcoming paper that synthesises the work undertaken in the ICM programme on catchment linkages will attempt to elucidate current and future threats to shellfish in the Motueka coastal environment. Fig. 1 Remotely sensed monthly average algal chlorophyll concentrations for December 2005. Fig. 2 Relationship between yearly riverine nitrogen loads and average annual algal concentrations from numerical model runs. A fundamental principle of Integrated Catchment Management (ICM) is the need for a common level of understanding of the issues, and the information related to those issues. Without this, real change, whether at resource-user level in the catchment or at council policy level, is unlikely. The way research information and knowledge are presented therefore has a significant bearing on its value and how it is used. One of our aims is to test innovative approaches to deliver information and knowledge generated from our research to our stakeholders and research partners to help bridge the gap between science and society. The overall goal is to shorten the pathway from research to uptake and use. In addition, these approaches help communication, understanding, and science management within the multi-disciplinary team. The approaches are also aimed at presenting the information in a range of different ways to complement the many learning styles of our end users. One of the ways we do this is via the Motueka ICM ‘Toolbook’. This interactive multi-media CD-Rom integrates and delivers the results of our science in “bite-sized” information supported by pictures, video, and graphics. Users can drill down or navigate in a non-linear fashion to items of interest. ‘Canned’ outputs from various models produced by the ICM team are included and allow the user to determine the impact of various management scenarios. The Toolbook distils and makes accessible a vast amount of ICM information from across the entire programme in one knowledge delivery vehicle. It links to underlying theory that supports the many strands of the programme. One of its aims is to connect what we know about the Motueka and its issues to the global catchment management scene. The CD-ROM format was chosen as it enables fast access to large amounts of information and material in an interconnected fashion, which is not easily possible using the web, especially in rural areas where broadband is unavailable (though the technology and speeds have improved since the programme began in 2000). It represents contributions from all scientists as well as from our agency partner, Tasman District Council, and from our stakeholder communities. Version 1.0 was released and trialled by members of the public at Nelson’s annual Ecofest in 2005, and has been used by stakeholders throughout the catchment, and as an example of integrated knowledge delivery to regional councils across New Zealand. The CD-Rom was developed by the ICM team in conjunction with the Institute of Resources, Environment and Sustainability, University of British Columbia. Version 2.0 is currently being developed and will be available early in 2009. Phillips C. (ed.) 2005. Integrated catchment management for the Motueka River. “Ridgetops to the sea”. The Motueka Catchment Toolbook. An interactive CD-Rom synthesizing science knowledge for the Motueka catchment and its international context. Version 1.0, July 2005. The value of collaborative learning with landowners is a fundamental tenet of Integrated Catchment Management. The Motupipi nutrient management project applied this approach to working with land users in the Motupipi catchment, in conjunction with the Ravensdown Fertilizer Cooperative, NZ Landcare Trust and Tasman District Council. The premise is that understanding each property’s contribution to catchment water quality will help land users work together to improve water quality, with – in this case – a focus on nutrient management. To date, this has only been partially successful due to concerns from some farmers that community expectations for improved water quality are too high; however, only one large-scale landowner declined to participate in the project. Such concerns can only be addressed through ongoing dialogue. The Motupipi catchment comprises 55% pasture (dairy and sheep/beef farming), 40% native vegetation, 3% gorse and broom, and 2% exotic forestry. In December 2007, 43 landowners with more than 2 hectares within the catchment were asked to participate in developing a nutrient budget for the whole catchment. After a walk-over, GIS maps of 10 larger dairy and sheep/beef farms were compiled for each landowner. These showed areas of exotic forest, native vegetation, gorse and broom, location of riparian fencing, use of nitrification inhibitors (Eco-N), silage pits, and culverted or bridged crossings. N and P losses were calculated from Ravensdown’s version of the OVERSEER™ nutrient budgeting model to map losses from soils across the entire catchment. Each of the ten farmers received a summary of nutrient losses for each block on their property, with confidential suggested management actions that could further improve surface water quality in the Motupipi River. Average annual N and P losses from the catchment are 61 100 kgN/yr and 2250 KgP/yr (± 30%). Pastoral farming contributes 80% of the N and 81% of the P loss. An estuary target for N is 18 250 kgN/yr to reduce the macroalgal and phytoplankton blooms. Assuming that rain falling within the Motupipi catchment also discharges within the catchment, some 17% of the catchment rainfall may be reaching the limestone aquifer in the west and 7% reaching the gravel aquifer to the east. However, based on a consistent nitrate-nitrogen level of 2.1 g/m3 in limestone bore water, some 30% of the nitrogen losses from the catchment are calculated as occurring via the Takaka limestone aquifer. With the source(s) of N in the Takaka Limestone Aquifer unknown at this stage and therefore difficult to remedy, this leaves little room for any leaching from farmland without breaching the target and causing algal blooms. Further implementation of Best Management Practices has been recommended, including fencing of streams and wetlands, riparian planting, irrigation scheduling, wider use of Eco-N, better management of silage pits, and nutrient management planning within an individual farm environmental planning approach. Motupipi Catchment 2006/2007 Nutrient Budget. Nitrogen.